These are some of my favorite Game Maker games by other people. Where applicable, links to a profile. The Ancients' Tome is unique and polished. Rather than exploring the game's world, you sort of explore the game itself. You can download The Ancients' Tome at GMG. 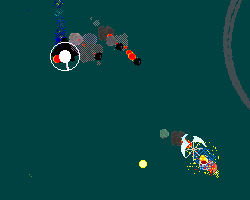 While you're at it, try Typogun, another excellent game by Pondwater. 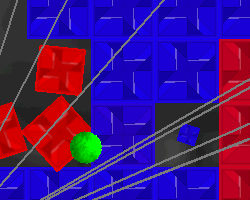 Ball Fall is a simple action puzzle game with good music. 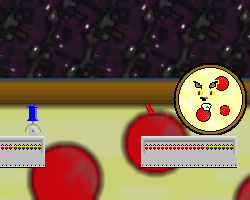 Once you learn what the different powerups do (press F1), it gets addictive. 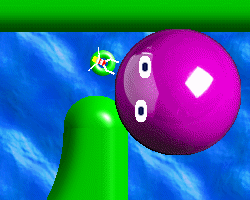 You can download Ball Fall at GMG. BDS Puzzleworld isn't really much to look at, but I think it's an excellent puzzle game. 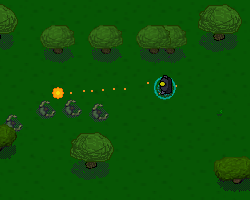 As you go along, it turns into an action game to some degree as well. You can download BDS Puzzleworld here. 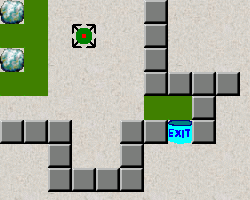 RandomDragoon also has some other puzzle-type games that are worth trying. 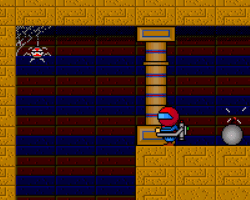 Dark Caves is inspired by an old Commodore 64 game of the same title that I haven't played. It reminds me of another C64 game called H.E.R.O. 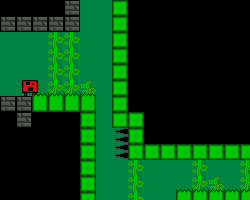 This is a simple well-crafted platform game. There's also a sequel, which is more of the same. You can download both at GMG. Destruere Pizzicato's source code was corrupted before Rabidbolweevil could finish it so the game is still a little rough, but I found it creative and amusing. Be sure to play it through to the end. There's also a sequel, and you can download both at GMG. FlapFlapFlap is clean, straightforward, short, and actually a little tiring to play with its Joust-like controls. Also, I like it. 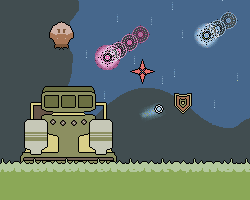 You can download FlapFlapFlap at GMG. These games are quite rough, but I like them just the way they are. You can download all 20+ Johnny games and stranger things at the "Paradise of Great Games" site. 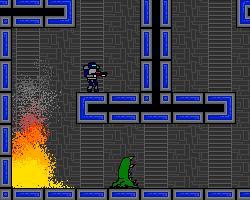 I've made a couple of Johnny fan games. A lot of people love the Jumper games, and a lot of people hate them. (It's kind of strange, actually.) If you like simple but challenging platform action games with ingenious level design, you might want to try Jumper. There are also two sequels, which are even better. You can download all three here. LockOn reminds me of Asteroids, Robotron 2084, and Bangai-o, but it's not a copy of any of these titles. This game captures what makes classic arcade games fun while still feeling distinctly modern. You can download LockOn at Iteration Games. And while you're there, be sure try some of the other projects. High-quality work. 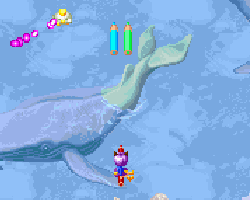 Macky & Pentell is based on the scrolling shooter Twinkle Star Sprites. It is colorful, well designed, and a lot of fun to play. You can download Macky & Pentell at GMG. Mage Craft is an action RPG with nice graphics and mechanics. I found the game extremely difficult in the beginning, but it leveled out as I progressed. 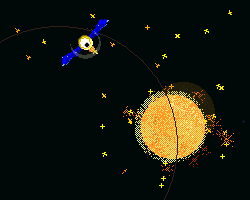 Mage Craft has depth and detail beyond what is normally found in Game Maker games. You can download Mage Craft at darthlupi.com. Try his other games, too. 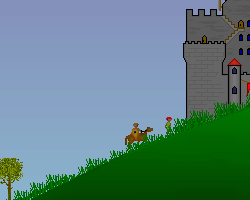 Medieval Clash is the English version of Tornim�e, a simple strategy game by an Estonian developer. It isn't especially difficult, but it's polished and a lot of fun. You can download Medieval Clash here or at GMG. 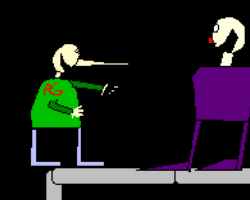 Pool also has a very nice (Estonioan only) city-building game called K�lavanem. This game is pretty simple and actually kind of punishing, but it was one of the first Game Maker creations that I felt compelled to play more than once. 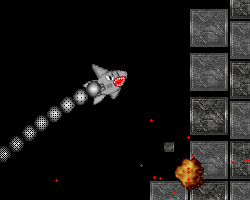 You can download Missile Wave 2 and lots of other games from Shawn64's Creations. Some of his other games are significantly more impressive than this one, and some are also quite violent. Unfortunately, SO was not completed when its source code was lost. Fortunately, it is a complete game in its present state and one well worth playing. You can download SO here. 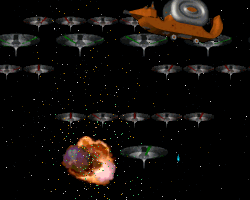 Space Oddity is an amusing Space Invaders / Galaga style game with a very nice War of the Worlds soundtrack and good graphics. Even if you think you are tired of this type of game, you might like it. You can download Space Oddity at Bouncing Fox Productions. Some of the other games there are also worth trying. Valence was unique enough to confuse me a little at first, but it quickly became a favorite of mine. From the sound design to the subtle graphical details, this is excellent work. You can find Valence at Iteration Games. Really, every game on that site is worth your time. 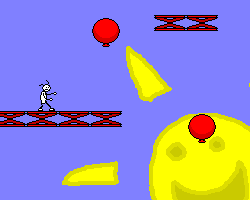 Wally is a simple, fun platform game with good animation and mechanics. Wally 2: Land of the Wallows is even better. You can download the Wally games at messhof.com or at GMG. 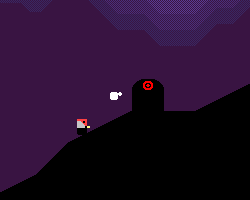 Messhof also has some more recent games that are pretty experimental and interesting. Water Panic is colorful and fun and has a lot of heart. You can download Water Panic here.